Every summer from the time I was 6 until I was 16, I stayed with my grandparents. Aside from some truly fun and lovely memories and in addition to some really ugly ones, there is the vivid memory of being measured on the wall each year. Now, I don't know a kid who doesn't love seeing how they've grown and I was no exception. I had the added bonus, however, of having my weight policed. 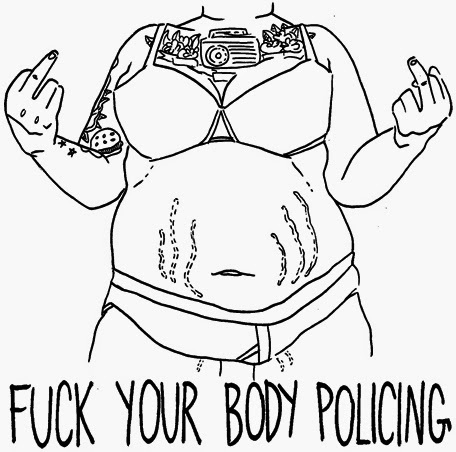 Before anyone says the standard, "That's not very Zen of you,"
helps put a stop to body policing." As I neared 5' tall, my grandmother started telling me that the "norm" for a girl is that at 5' tall, she is to weigh 100 pounds and 5 pounds for every inch thereafter. I was asked how much I weighed in comparison to this norm. This happened every year. Every single year for 10 years. Guess what I have never gotten out of my head? And guess what I'll be damned if I allow myself to repeat aloud, even if it does sometimes creep back into the forefront of my mind from where I keep it hidden in its ugly place in the back? Never, NEVER will I police my son's body. Never, never will I police anyone else's. Want to mess with your child's head? Police away. Otherwise, let them be.